The latest releases of Exselo Desktop have resulted in world-wide attention and a substantial increase in product downloads. Also, Exselo and Exselo Desktop are featured in a two-page long story in the most recent edition of Computerworld Norway (issue 8-2016, in Norwegian). The story describes the idea and technologies making up Exselo Desktop and how this tool can help you become more efficient in your working day, using secure search, sharing, collaboration and communication with colleagues and friends. 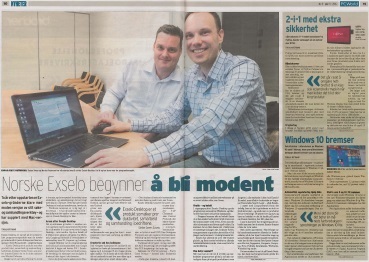 Read the full article in Computerworld Norways subscriber section here. Exselo Desktop is available from the Download section on our webpages.